The Comoros Islands consist of a group of islands in the Mozambique Channel, about two-thirds of the way between northern Madagascar and northern Mozambique. 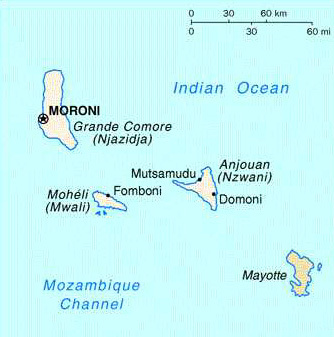 The capital is Moroni, located on Grande Comore (Ngazidja). A French colony prior to 1975, Comoros Independence Day is celebrated annually on July 6. The total land area is 2,170 square kilometers, with 340 kilometers of coastline. The Comoros Islands are of volcanic origin, with a countryside ranging from steep mountains to low hills. The highest point is Le Karthala, an active volcano at 2,360 meters. The population is 596,202 (July 2001 est.) Fishing and farming are the most common occupations. Principal food crops are coconut, cassava, and bananas. Vanilla, cloves, perfume essences, and copra are important contributors to the nation's economy. The Comores are the world's number one producer of ylang-ylang essence, an ingredient in perfume. With two-thirds of the world's perfume essence coming from these volcanic islands, it's no surprise that the Comores are also known as the "Perfumed Islands." In addition, it is the world's second largest producer of vanilla. The Comoros Islands are blessed with warm tropical weather, extraordinary flora and fauna, and incredible white sandy beaches. Comoros beaches are considered to be among the most beautiful in the world. Lush foliage, majestic waterfalls, picturesque towns, and incredible coral reefs abound. There is a rich history and culture imported centuries ago by Arab, Portuguese and French traders. Today's visitors can explore the ancient mosques, volcanic lakes, white sandy beaches, and countless other natural wonders. Among the Comores wonders is the coelacanth, or Gombessa, an endangered "living fossil" fish once thought to be extinct for millions of years. Livingstone's flying fox, a fruit bat with a wing span of 3 meters, is found nowhere else in the world. The languages spoken are French, Arabic, and Comorian, a blend of Swahili and Arabic. In November 1975, the Republique Federale Islamique des Comores became the 143rd member of the United Nations. 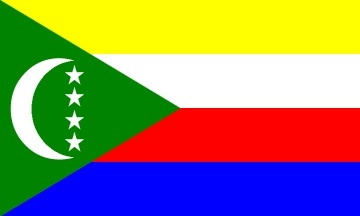 Since 2002, the nation has been known as the Union of the Comoros.